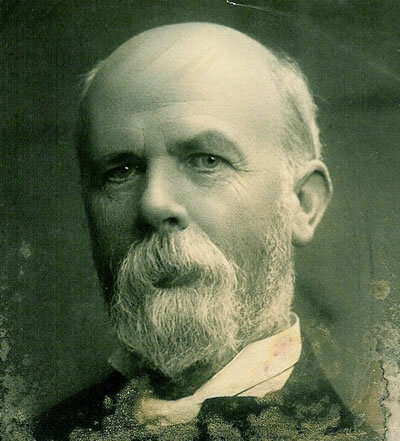 Reverend Octavius Frank Walton was born at Kingston on Thames on 28 March 1844. He was the eighth son (with a twin sister who died young) and the last of 13 children of William Walton and Elizabeth Louisa (nee Plunkett). His father, William Walton, had been born in 1794 at Reading and his mother, Elizabeth, had been born in 1801, and died 1889. William Walton had been a Master at a boarding school at Church Street, Hampton, and later, around 1822, at St Georges, Bloomsbury. Octavius Frank went to his father’s school and then on to Cambridge (St. John’s) in October 1869. In 1872 he was ordained a deacon in York and became a priest in 1873. 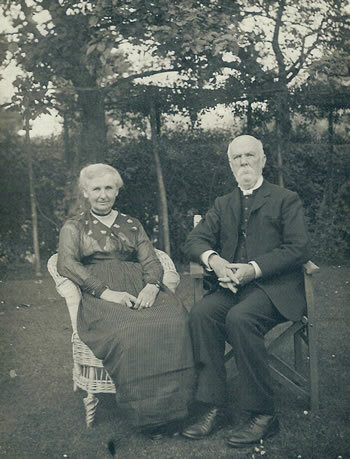 His ministry began in Hull from 1872-1875, where he met Amy Catherine Deck, the daughter of a vicar, whom he married. After his curacy they went, in 1875-6, to Jerusalem as the Anglican Vicar at Christ Church, Mount Sion. Their first child, Lucy Olive was born there. Christ Church is in the Old City by the Jaffa Gate and is built like a synagogue and has the Lord’s Prayer and 10 Commandments in Hebrew, so Jewish people would feel more at home than in the usual church. After their return, the family lived at Cally in Scotland from 1877 to 1883, where three of their children were born. From 1883-1893 Octavius Walton was Vicar of St Thomas’s in York from, and from 1893 to 1906 he was Vicar of St Jude’s in Wolverhampton. He came to Leigh in 1906, and was Vicar her until 1918, living at The Old Vicarage. As Vicar, Octavius was Low Church. He presided over the Church of England Village School, which started each day with a hymn and a prayer followed by Bible and Prayer Book study. His sermons, it is said, often seemed to include the fact that Noah’s Ark was exactly as long as Leigh Halt platform. Sunday School was presided over by the “plump and homely” Mrs Walton at 10.00 am Sunday morning in the School Room. Octavius was on the Committee of the Leigh United Charities as Vicar, as well as on the Committee of The Reading Room and Institute. 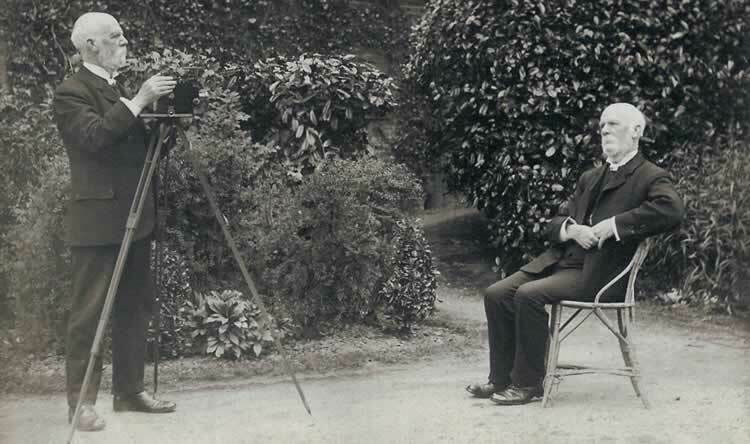 He was also a keen amateur, and the Historical Society has a collection of his photographs including some self portraits, with one of him playing chess against himself. He was also very keen on his garden. Octavius and Amy went on expensive holidays, no doubt in part with the money Mrs Walton earned from her books (see Part II). They also rented a cottage at Studland Bay for a good number of years. There is a photo of them in the Historical Society’s collection. In total, Octavius and Amy had seven children. Lucy Olive born in Jerusalem in 1875, and died 1953. Stanley Howard, Melville and Daisy were all born in Cally Scotland. Stanley Howard died aged about 15. Ivy was born in 1885 in York, and married Frederick Cecil ( who died 1976); Richmond born in 1888 in York, and finally Myrtle who died young. On retirement, the Walton family went to Shamley Green which they did not like, before returning to Leigh in 1927, where they had a number of relatives. He and Amy lived at Great Barnetts with their daughter, Daisy, and later their daughter Ivy as well, who returned there after the death of her husband. 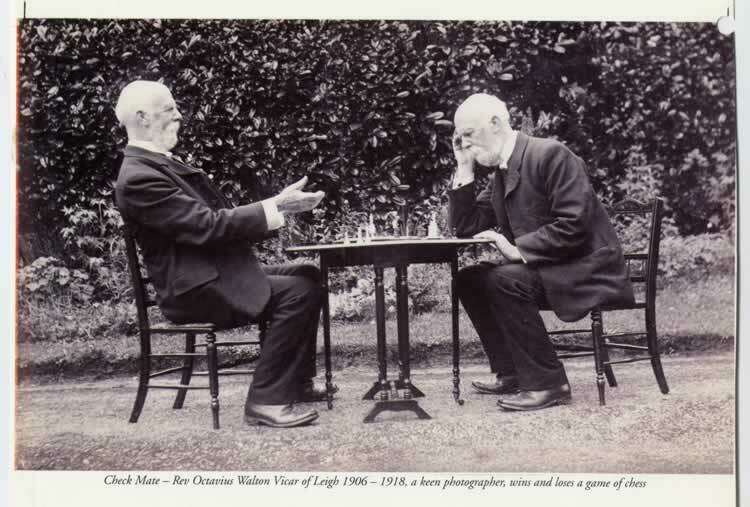 Rev Octavius Walton, vicar of Leigh 1906-1918, a keen photographer wins and loses a game of chess! Octavius Walton’s wife, Amy Catherine Deek, (whose mother wrote hymns), became a writer of children’s books: her first book “My mates and I” was written in 1870 before she married and was first published under her father’s name, although later under her own name. Her other books included “Christie’s Old Organ”, “Angel’s Christmas” and “Christmas Angels”, as well as “A Peep Behind The Scenes”, a story of a circus family, which was later made into a film. Several of her books were made into plays. One was translated into Welsh and many had very large sales all over the world, particularly in Canada and the USA. In their day, her books – mostly for younger children – were bestsellers and had strong moral/Christian values. They all had relatively sad endings, and reflected where she was living at the time of writing. Her book “The Lost Chick” was for older children. Her books were often given as Sunday School prizes. Some of her books are still published today. She also wrote prayers for children (For further details of her books, there is a full list on the web under Amy Catherine Walton). Amy was also very involved in life at Leigh, running the Mothers’ Meeting at Leigh and the Sunday School. Her two grand-daughters by Melville – Stella and Diane – would sit in chairs at the front of Sunday School facing the village school children. Octavius and Amy’s daughters, Daisy (b. 1883) and Ivy (b. 1885) both became VADs in Leigh in Great War. During that time, Ivy met Mr Frederick Cecil (known as Phil), when he was an officer recovering in the War – initially he could not even talk. They married whilst Ivy’s parents were living at Shamley Green and they went to live in India. Ivy had a child in India who died soon afterwards. After their son Jerold was born, Ivy was so ill that she came back with the baby to the UK for treatment. They were about to return to India, when they heard that Phil had died. It was then that Ivy, with her young son, Jerold, went to live at Great Barnetts. Ivy became a teacher at Hilden Oaks School. Daisy, who did not marry, used to help Mr Herbert Russell with the Leigh Scouts, including trips to Studland Bay. She also wrote and produced the Easter Scouts play certainly from 1912 as well as running the Sunday School at Great Barnetts. Before Ivy married, she and Daisy both went to India where they had relatives. They also had a holiday in Egypt together. In 1962 Daisy had Pippins built by Gilbert Butcher at the same time as he built the new vicarage. Daisy had bought the land from Mr Randerson, who lived in the house (the converted stables) behind Pippin Cottage, called Inglenook. Monica Cecil, Ivy’s daughter, went to live there from Penshurst Road in 1964, remaining at the house until in 1977 when she moved to Tonbridge. Daisy died 1967. Octavius Walton and Amy lived at Great Barnetts from 1927. What was life like at Great Barnetts in the late 1920s and 1930s? There was running water and WCs by the 1920s, although there was an old pump in the kitchen scullery. There was also a 2 or 3 hole lavatory to the right on leaving the back door. There was gas for cooking in 1920s. It would be porridge and toast for breakfast with home-made marmalade (100lbs were made a year!). They had local bacon usually on Wednesdays and Sundays and lunch, the biggest meal of the day, was always meat with 2 vegetables and sweet, such as rice pudding, apple tart or even French pancakes. Tea was bread and butter and jam, served on a special silver tray. Supper was something like scrambled eggs or mushrooms on toast. The mushrooms were usually picked in the fields behind the house. Wednesday often meant steak and kidney pie. The Waltons also employed a number of servants to help. Octavius died 1933, and Amy in 1939. Both are buried at St Mary’s (and there is a plaque in the Church for Octavius).